I am a travel, adventure and personal essay writer. I have also written more SEO copy, website content and corporate communications material than you can shake a stick at. I am working on a book about my year as a go go dancer in Greece. I also publish a little magazine about whales once a year. Contact me if you want something said just right. The National Geographic story continues about my quest to help a little Mexican fishing community bring their local ocean back to health. National Geographic Explorer, Katherina Audley, chronicles the first year of her collaborative whale research and community development project in Mexico. National Geographic Explorer, Katherina Audley, tells the story of how a love for whales, Mexico and making good things happen for people spurred a project that is bringing an endangered ocean back to health. Carved into stone long ago, mysterious natural images still enchant. Boats? Bats? This scenic park on the Clackamas River southeast of Portland has it all. This fishing village east of Anchorage welcomes wildlife photographers, anglers, and adventure seekers to the edge of Prince William Sound. Framed by snowcapped peaks, the town is accessible only by sea or air—one reason it maintains its relaxed charm. A tub with a view, a bottle of wine, a fireplace, and a dog. What better way to enjoy the coast in the wintertime? One can only belt out so many renditions of "Don't Stop Believing" from the bar top before it begins to feel a little empty. So on your next trip to Puerto Vallarta, consider stepping off the tourist trail and into the less worn path of the traveling philanthropist, even for a few hours. For a small-town feel plus great eats, head to this hip part of north Portland. I have been dipping and skimming on the surface of our local waters for years.... But I wanted to go deeper, so my husband and I decided to ride our 14-foot 1952 runabout boat from Portland almost to the sea. I used to turn my nose up at the Long Beach Peninsula. The trucks on the beach kept me and my fetch-obsessed dog away. But thanks to a Groupon-fueled weekend at the Adrift Hotel last March, I found out how much there is to love about Long Beach. A lesson on surfing and fluidity turns a day at the beach into an invigorating adventure. When a wild orca emerges from its watery home to inspect you, its pectoral fin quavering up to 6 feet out of the water, or when it bursts into the air in a slow spin then crashes back down and slips away, the experience will burn itself into the part of your memory where best days ever get filed. With a great instructor and a cozy wetsuit, learning to surf on the Coast can be a breeze. 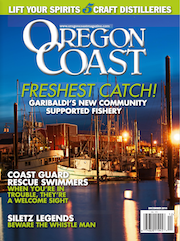 Despite the competition, catching salmon during their late-summer run is practically guaranteed in the Columbia River's Buoy 10 region. Port Orford had on her prettiest frock the weekend I visited. Sunshine coated Battle Rock with caramel and sparkled upon the seal heads bobbing in the quiet surf. Inland, the same sunbeams shone hoary as they flared between grandfather cedars. Here in the Northwest, it’s easy to buy locally caught wild salmon at your neighborhood supermarket. But no fish tastes as succulent as one you pulled out of the water that morning. Every spring, the Columbia River and its tributaries, including the Willamette, become peppered with little boats in pursuit of the tastiest salmon of them all: the spring Chinook, known by local fishermen as “springers.” Just in from a winter of gorging on small cold-water fish in the Pacific, springers have firm flesh, a vibrant pink color and a lip-smackingly high fat content. News of violence in Mexico has frightened many visitors away in recent years. But smart travelers know that there are hundreds of places in Mexico, a country roughly the size of Western Europe, that have been untouched by recent events. The following 10 places are just a tiny sampling of the many of beaches, cities and towns in Mexico for which no safety advisory is in effect. Laurel Patrick was never much of an animal person before she built a house on the beach in Playa Blanca, Mexico, 13 years ago. She certainly didn't aspire to become patron saint to the critters of the region. She only meant to escape Oregon's dreary winters in a tropical paradise by an undulating cyan sea. Perfect beaches are as hard to find as pristine conch shells. Having dedicated my early adulthood to becoming a beach connoisseur, I know of a few that fit the bill. But I know only one that has all the attributes above and requires no long layovers or extended transport between airport and destination: Playa Blanca. I am not birdy like my good friend Heather, who's one of those people who paid for the bird app on her phone. It takes a big, obvious animal, like a breaching whale, to get my heart pumping. But I envy Heather's ability to get excited about a woodpecker -- she can just hang out in her backyard with a cup of tea and watch the drama unfold. My husband and I headed into central Oregon for a weekend of angling and wrangling to see what all the fuss was about. We stayed in a 1966 Airstream trailer at FlySpur Ranch in Tumalo complete with the sound of horses snorting outside our window. Muy cowboy. A handful of restaurants and seafood markets on the coast make it a priority to serve local seafood that is in season. Below are a few of my favorite locavore restaurants and seafood markets on the North Coast. Thousands of visitors from all over the world descend into the belly of Sea Lion Caves, located just north of Florence, every year. Some come for the chance to get closer to Steller sea lions in their natural habitat. For others, it's a family friendly diversion as they travel up or down the coast. As for me, I keep going back. I'm practically a regular. I just love the way the caves assail my senses. I'm in between the John Muir types who scamper over fields of scree to dine on reconstituted chicken and rice, then bed down in ascetic mummy bags; and the princess campers who toss ice cream-making-balls around the fire and serve it up on matching 38-piece mess kits. I am willing to give up a bathroom, electricity and running water for solitude, but I need a good night's sleep and a latte in the morning in order to be nice. I long to escape the reaches of Wi-Fi but hate hauling a heavy pack. I like to camp in comfort and give bonus points for style. There's a word for people like me: Glampers. If dog heaven were a place on earth, it would look a lot like the Oregon Coast. All 363 miles of beach are publicly accessible and only a few are closed to dogs. Endless trails through lush forests offer a respite from the wind and salty sea. Hotels vie for the privilege of pampering you and your dog with complimentary chew toys, cozy beds and fireplaces. Considering that weddings are often your one chance to bring all the important people in your life together, it's unfortunate that the big event is often a dizzying, stressful blur with little time to spend with anyone. A destination wedding in Mexico is a great way to slow it all down and spend quality time with your loved ones. It's warm down there, relaxing and beautiful. There are comfortable accommodations for every budget and taste. Delicious food and drinks are abundant and easy on your wallet. When Mary Tagliaferri and Isaac Cohen co-founded the Complementary and Alternative Medicine Program at the University of California, San Francisco's Carol Franc Buck Breast Care Center and opened the first traditional Chinese medicine clinic at UCSF, their plan was straight forward: employ state of the art technology to rigorously identify and test the active ingredients in traditional Chinese medicine herbs and botanicals. Little did they know that 15 years later they would be working with the FDA to test oral botanical drugs for major medical indications. When a tuna hits, it feels like you've got Lance Armstrong's thigh on the line. Visitors flock to the coast to view migrating gray whales during winter and spring, but you can see whales all summer in the waters around Depoe Bay. You lean in for your kiss. It opens up its blowhole and, “Whooosh!” you’ve been baptized with whale breath. Consider yourself initiated into the church of the whale. I’m a landlocked mermaid here in Portland, Oregon. Yes, the landscape is green and lush. And the people are wonderful. It’s a foodie heaven and culturally rich for a city its size. But after fifteen years of constant tides in my periphery, I never thought I would leave the ocean again. Kiera is the kind of seven year old who goes tearing down a hill on a broken bicycle, crashes, comes up spitting teeth and blood and says, “Whew! That was an experience.” So when that scorpion stung her, she was more pissed off than scared. “That thing bit me!” she said, and squished it with a flip-flop. Meanwhile, the rest of us freaked out. One summer day in the San Juan Islands, orcas gathered near shore for soulful songs by First Nations performer and a choir from Seattle. Joseph and I track down one of the world’s experts on blue whales, Fernando Arcas, and spend an unforgettable day on the water with him in Baja. Now that the orcas were in plain sight, the Tlingets resumed their drumming and singing....just moments later, a 6-foot high pointed male orca fin rose up directly in front of us. I land myself a gig as a deckhand on a gillnetting boat. Trouble ensues. Stockwell, Shelley. Denial Is Not A River In Egypt. (Creativity Unlimited, 2003). The Ever Dancing Muse. 1996. Off the cuff, bite-sized chunks, etc. I fulfill my viking model duties at Granlibakken, a ski resort in Lake Tahoe, with two other real modern day vikings. It starts with a group e-mail: "okay. have i got a deal for you. i've procured a 10 cd player with great speakers and have no music. so. here's the deal: you send me music, i DHL you fish..." A horny pirate, the wacky birthday fairy, uppity orca scientists and the little dictator join the mix. It ends in tears. Let’s all go ahead and be very very soft. Let’s speak softly and walk softly and hold each other softly and think soft thoughts about soft things. Let’s all be big softies and have lots of give and wear soft clothing that makes people want to touch us.